Most towns have them and Holt has her share: signs, images, statues, curios, architectural features, market crosses, quirky bits. Here are a couple which you might have missed – or might not. It's worth keeping your eyes peeled. He's a bit battered by age and the elements but he is still rather a fine figure as he sits, as proudly as he can, on the low wall next to Nicholsons on the south side of the High Street not far from the junction with the Norwich Road. 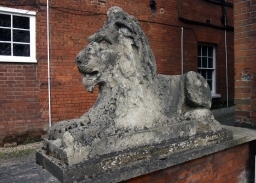 Once he dominated the scene and surveyed his kingdom looking west from his perch atop the fine Georgian building which took its name from him, Lion House (later Betty's now Bakers), with its yard across the road. We have early 20th century photographs to prove his once exalted position but eventually it was decided that he represented a threat to his people passing below his parapet throne. And so he came to earth – though his dignity ensured his continued existence at a lower level. How old is he? Not Georgian perhaps but certainly Victorian. Who put him there in the first place? Where was he made? 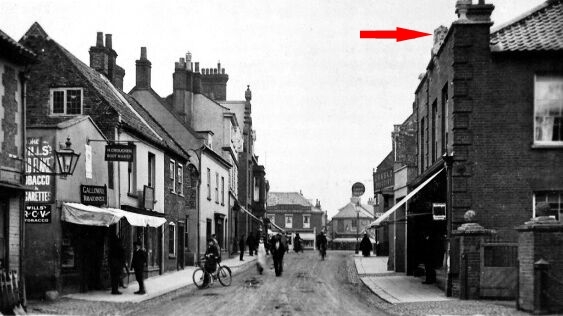 This last we can answer in part as what is probably the the name of the monumental masonry firm which crafted him can faintly be made out on the side of the base and, quite clearly, the town where he was born – Fakenham. So there are many unanswered questions about Holt's Lion. Perhaps someone reading this can shed some light? For now he stares stonily and inscrutably at pedestrians and traffic as they pass. I like to think he is dreaming of his glory days high above. As you approach Obelisk Plain, almost opposite Lion House, you come to Loynes Yard where generations of that family worked at the blacksmiths trade. You will notice that several of them placed their initials on their cottages. 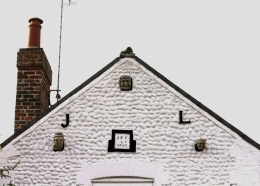 On the gable end of one you can see 'J L' and the date of construction '1803'. But that is not all for there are also three grotesques. Everyone has heard of gargoyles high up on the roofs of gothic or medieval cathedrals and churches usually in the form of devils, griffins, monstrous animal-like beasts or perhaps, of caricatures of fellow craftsmen. These had a purpose for they all contained a spout to project rainwater thus preventing the loosening of the mortar and the destabilising of the structure. 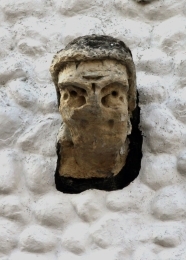 Grotesques were mainly for decoration in stone or wood inside and outside a church or manor house. They often depicted demons or fantastical mythical figures. 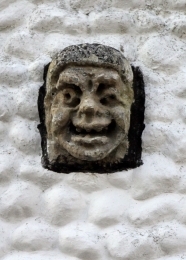 How these grotesques came to adorn the wall of this house (Owl Cottage) is not clear. Until recently re-discovered they had been tarred over as ugly excrescences. Fortunately they are now clearly identifiable. One appears to depict simply the grimacing face of a slightly alarming child until one detects on its forehead the emergence of prepubescent horns. But how old are they? Were they foraged from some decaying church? Why? Does it matter? Perhaps not. Interesting, though.